There’s no doubt that fashion month is a whirlwind for all involved, and the sheer amount of shows and street style to keep up with can make even the most seasoned sartorial fans work up a sweat. Ahead, we take a look at some of our favourite moments from SS18’s jam-packed schedule. Now in their seventh season of tracking diversity at NYFW, The Fashion Spot found the SS18 runways to be the most diverse to date. According to their report, 36.9% were models of colour (up 5.4% from FW17), with every show casting at least two models of colour. Records were also broken across body and gender diversity, with 90 plus size models and 31 trans- or non-binary models taking to the runway this season. Ultra-femme fashion label Alice + Olivia tapped a host of female artists to contribute to one of the most intriguing sets of the season. Designer Stacey Bendet hand-picked some of her favourite artists to help recreate the Chelsea Hotel with female residents only. Each look was styled to correspond with the room it complemented best - a pink, palm tree-dotted bathroom by Angelica Hicks; Jemima Kirke’s living area with works from Suzie Lopez; an artist studio by Lola Schnabel, Talulah Willis’ sitting room; Francesca DiMattio’s entrance; a kitchen designed by Lucy Sparrow; bedroom by Blair Z; and a Janis Joplin-inspired garden put together by Bendet herself. For his third ’see now, buy now’ season, Tommy Hilfiger pulled out the big guns. His Rock Circus theme tapped into the designer’s long-standing love of rock-and-roll, with a heavy dose of nostalgic glamour. The show opened with not one, but three Hadids decked out in head-to-toe Tommy x Gigi, with both the men’s and women’s collections fusing the best of American subculture with haute hallmarks of London’s iconic punk scene. Post-finale, a troupe of acrobats and EDM duo The Chainsmokers kept the party going, while pop-up booths allowed showgoers to purchase pieces straight from the runway. Donatella Versace chose to dedicate the SS18 show to her late brother, Gianni. Signatures of his work were evident in the collection’s opulent, dizzying patterns, embellished Vogue collage motifs and pop-art prints echoing the work of Andy Warhol’s iconic Marilyn Monroe portraits. While the clothes generated buzz, it was the finale that stole the show. A curtain was drawn to unveil five of the original ‘90s supermodels wearing slinky gold dresses, who took to the runway arm-in-arm with Donatella taking her bow. When you assemble the likes of Crawford, Campbell, Christensen, Schiffer and Bruni, you know it’s going to be BIG. 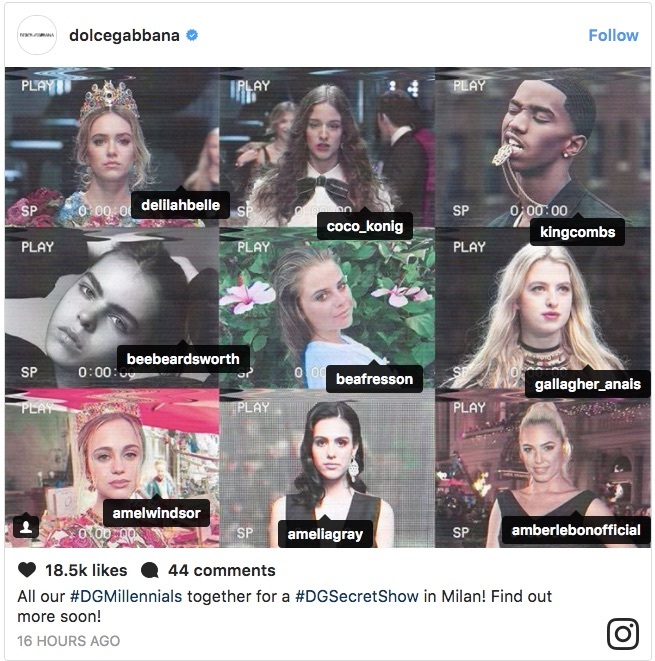 It’s no secret that the Italian fashion house has a thing for millennials, and this season the duo hosted an exclusive pre-show show for the creme de la creme of Gen Y and Z. Fourteen hours before the scheduled catwalk, 36 millennials took to the runway to showcase this season’s wares direct to Dolce & Gabbana’s Instagram Stories. With the likes of Macklinley Hill, Christian Combs and Ella Richards in tow, this underground event proved to be one of this season’s hottest tickets.